•	Annual allowance for income tax to increase by £1,000 to £7,475 from April 2011 although the higher rate threshold will be reduced so that higher rate taxpayers do not benefit from this change. This is worth £170 a year to basic rate taxpayers. Limited Company v Sole Trader? Is being a sole trader or a limited company the most tax efficient form of business for me? This is a question that many people don’t consider as they see a limited company as having more paperwork, more accountant fees and more legal implications. The truth is however that the paperwork and the accountancy costs involved are often outweighed by the tax savings that you can get as a limited company. 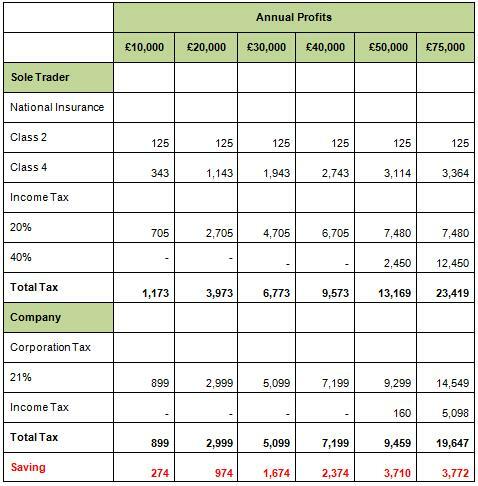 Below is an illustration that highlights the tax savings that a company could achieve based on the 2009/10 UK tax rates (these rates also apply for 2010/11 for income up to £150k). It is assumed that any company profits are first extracted by a salary of £5,720 in order to make the most of personal allowances and avoid national insurance contributions, with the remainder drawn as dividends. It is assumed in this example that there is no other taxable income to be considered. ABC North East takes every care in preparing information to make sure that it is accurate and up to date. However, no responsibility can be accepted for anyone acting from or refraining from acting as a result of this material by ABC North East.